Are you looking for a new place to call your home? The various options on the market might be quite overwhelming for you. Why not choose practical yet quality residential structures, such as doublewide homes in Jacksonville? This type of home has been gaining prominence among buyers. Read on to learn more about the appeal of doublewide homes to Jacksonville residents. We offer the best double wide homes at an outstanding price. How spacious are doublewide homes for Jacksonville families? Contrary to popular belief, mobile residences, such as doublewide homes in Jacksonville, can be very spacious. Families with kids can live comfortably in this residential structure. If you are looking for a quality house that suits your lifestyle and budget, then doublewide homes for Jacksonville families will work best for you. Are modular houses different from doublewide homes in Jacksonville? Even though these two housing options are made based on a customer's chosen floor plan, they are not the same. 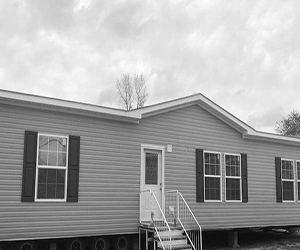 Unlike modular houses, doublewide homes for Jacksonville residents are mobile. The latter has sections that are built on a steel framework with axles and wheels. A full foundation is not necessary for doublewide homes in Jacksonville. On the other hand, modular homes must be installed permanently in a particular location. Is it possible to customize doublewide homes for Jacksonville residents? Yes, you have the liberty to customize doublewide homes. Jacksonville prefabricated houses are not based on a single floor plan. When customers are unable to find existing layouts that they like, they have an option to create their own floor plan. The manufacturers can build doublewide homes in Jacksonville according to the customers' preferences. Are doublewide homes in Jacksonville energy efficient? When manufacturers start working on doublewide homes for Jacksonville customers, they ensure that these houses are HUD-code compliant. As a result, the doublewide homes in Jacksonville are constructed to become energy efficient. When you choose to live in this type of residential structure, you can expect to pay less for utility bills in the long run. Have you ever considered purchasing doublewide homes? Jacksonville families can rely on our team at Home Connections in their search for the perfect house. We are committed to providing affordable and quality doublewide homes to Jacksonville residents. When you have a place to call your own, you can feel more secure. Let us help you and your family find the home that suits you best. The possibilities are endless when it comes to styles or designs for doublewide homes. Jacksonville citizens who have taken a liking for this residential structure should browse through the floor plans offered by Home Connections. We are affiliated with several manufacturers who are highly skilled in building doublewide homes for Jacksonville customers. If you would like to see our provided floor plans, please visit our page. Should you find that none of these are to your liking, just send us a draft plan so we can create an actual floor plan for you. Families who have bought doublewide homes in Jacksonville have enjoyed all the comfort and functionality this type of housing can offer. If you also want this housing for yourself and your loved ones, get in touch with us today! We'll discuss the floor plan that you like for doublewide homes in Jacksonville. Call us at 910-298-3387 or visit our website at http://www.ourhomeconnections.com to get started. We at Home Connections work with a focus on quality and integrity. Apart from being a factory-built housing business, we're a licensed general contractor. Our staff of diligent professionals strives to complete every project down to the client's most minute specification. With our extensive knowledge in building codes, we also make sure that all our processes are performed in compliance with the law. Turn to our team for superb modular housing solutions, and let us construct your ideal comfort home. Are you planning to buy a house? Live the American Dream with our economic and sustainable housing solutions! At Home Connections, your dream home is within your reach. Get in touch with us today at 910-298-3387. To learn more about our company, visit our website. People love our homes and the price we offer.